HOME /Blog /How does UGEARS TRACTOR AND TRAILER model work? UGEARS introduces one of its vehicle mechanical model sets, the TRACTOR AND TRAILER. 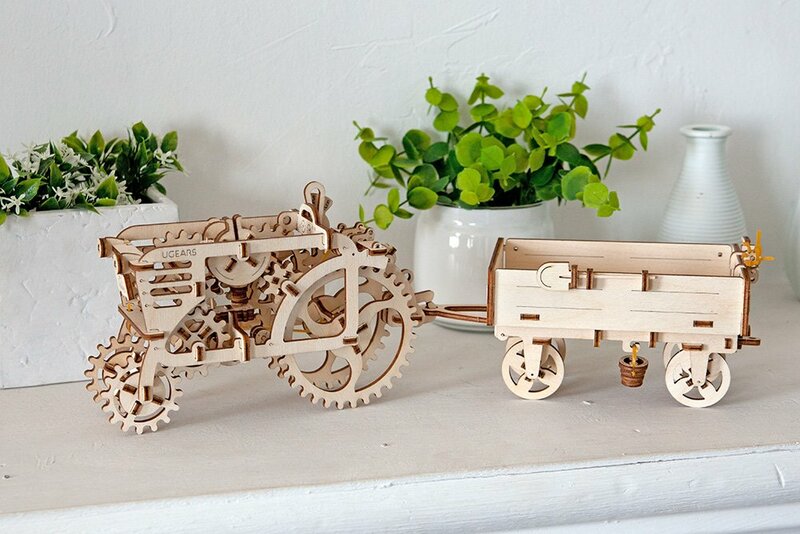 This perfect farming duo, the TRACTOR AND TRAILER, like all UGEARS models, produces real motion without the use of electricity or batteries. How is this possible? The set consists of 165 pieces, 97 of which belong to the Tractor. It is the Tractor, that provides a moving force and spikes the most interest. Nonetheless, the Trailer deserves just as much attention, and this is why. The Trailer consists of 68 pieces and requires 1 to 3 hours to be fully assembled. The Trailer itself does not have a moving mechanism, however, it features a few moving parts of its own. It is equipped with a side gate, that opens with a push of a lever for quick loading and unloading, and a crank in the front, that tilts the bed for easy dumping. Once the bed is brought back into the initial position, the side gate closes automatically. 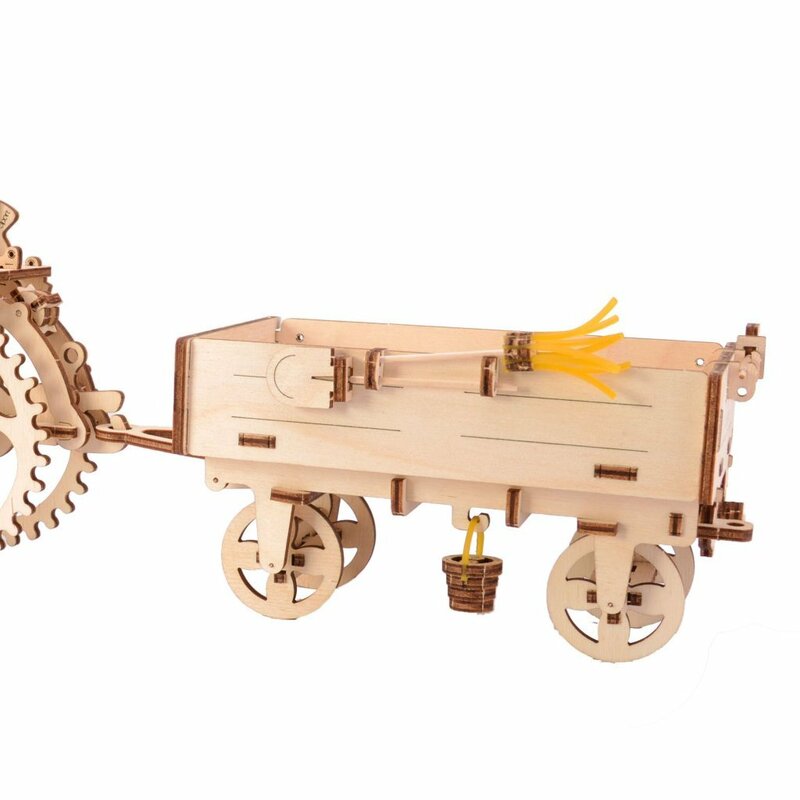 Each Trailer is complete with a hook coupler that connects it to the Tractor, and a few cute little details, such as a pitchfork, a shovel, and a bucket with a broom. 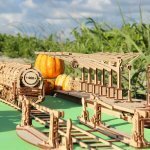 This set is made with high-grade wooden materials and features a unique, recognizable for UGEARS models, style. The Tractor is the complex and sophisticated part of TRACTOR AND TRAILER duo. The small front wheels are responsible for setting direction, while the large rear wheels, the “driving wheels”, are the actual moving force of this model. The “driving wheels” are fitted with an elastic gear, that is connected to the motor, located under the hood of the Tractor. The entire design of the Tractor allows observing the work of the rubber-band motor’s interconnected moving shafts and gears. 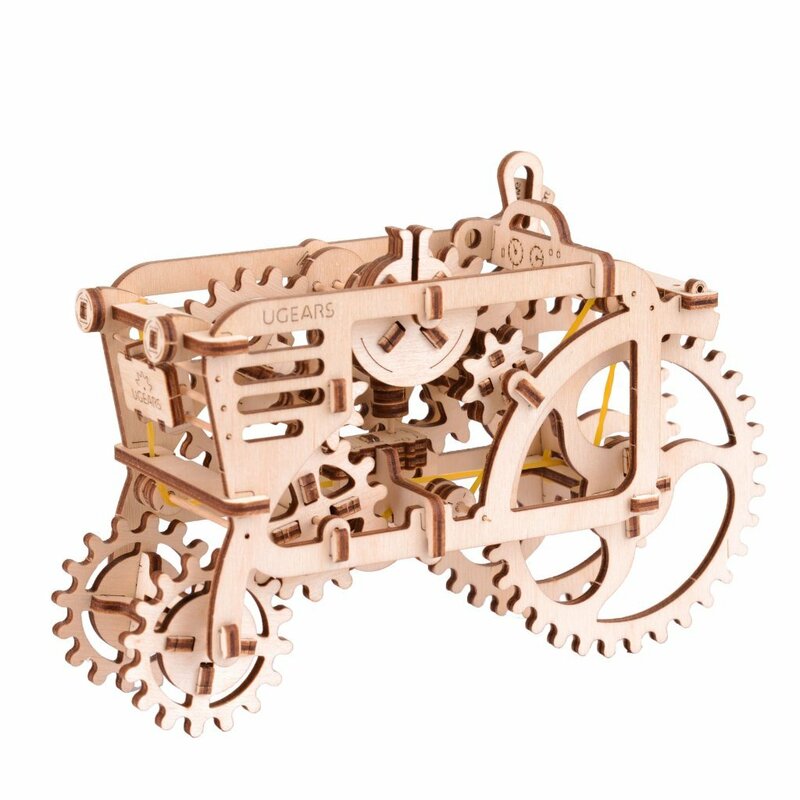 Once your UGEARS Tractor is assembled, you can take it for a test drive. The Tractor is set in motion by a pullback motor. Simply place your model on a flat surface, pull it backward, release the trigger gear, and watch it run ahead! While the Tractor is in motion, enjoy the spectacular work of its motor moving gears, shafts, and pistons. 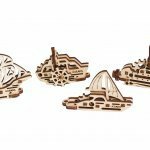 Order your own UGEARS TRACTOR AND TRAILER set on our website today!